Ferries cross from Padangbai harbor to Lembar harbor every hour, 24 hours a day and the crossing takes 4 - 5 Hours (plus sometimes considerable waiting around for loading and unloading). The Ferry ticket available at the harbor only (both Padang Bai or Lembar). The Islands; Bali and Lombok separated by Lombok Strait. 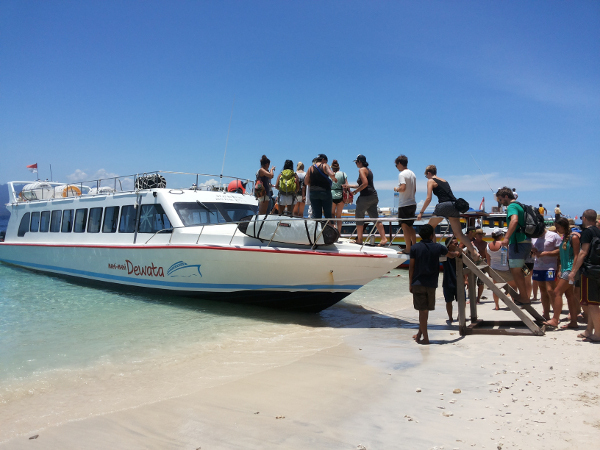 If you travel on a budget, public ferry is the alternative mode of transportation to reach Lombok. It departs from Padang Bai (East Bali) to Lembar (West Lombok). Ferry service departing every hour, operating 24 hours. Public ferries' provide services for both passengers and vehicles. The trip normally takes four hours (but it can be considerably longer in poor weather). This service runs 24 hours a day. It should be understood that this ferry has a poor safety record. Disembark from Padangbai or arriving at Lembar Harbor do not let a local porter take your bags/luggage unless you have negotiated absolutely what you will pay before he puts his hands on your bags. Best to avoid the service completely if possible as it can be fraught with complications over prices. While they are cheap, it can cost quite a bit extra to get to Padangbai so its worth comparing all alternatives. Lembar in the south west of the island is Lombok's main port and handles small freighters, fishing boats and the combination vehicle and passenger ferries heading westward to Bali. Padang Bai (also Padangbai and Padang Bay) is a small port town in East Bali, the port for ferry terminal from/to Lombok. Situated in Northeast of Gianyar 29 km, from Kuta 62 km, and from Denpasar 56 km. 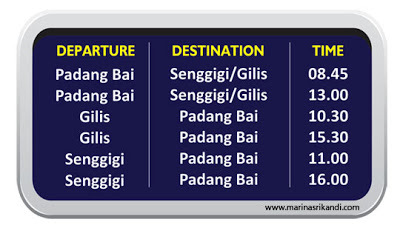 Padangbai can be reached from Sanur in more and less 1 hour. If you're arriving in Lembar and need transport, you'll find the Lembar bemo drivers hard bargainers. Tips: If you are leaving from Lombok, chances are high that someone will approach you and offer the ticket to Bali for same or cheaper than going the current rate of Rp 36,000 (March 2011). They'll also try to move you past official ticket offices (at the entrance gates of the harbor). It may be cheaper, however, you won't get an official ticket, or get only second part of it (the first one normally goes to the security on the pier). So, you may end up without a valid ticket and, if some security check happens, may have to pay again and suffer a lot of confusion. Just buy the ticket at the official ticket booth. 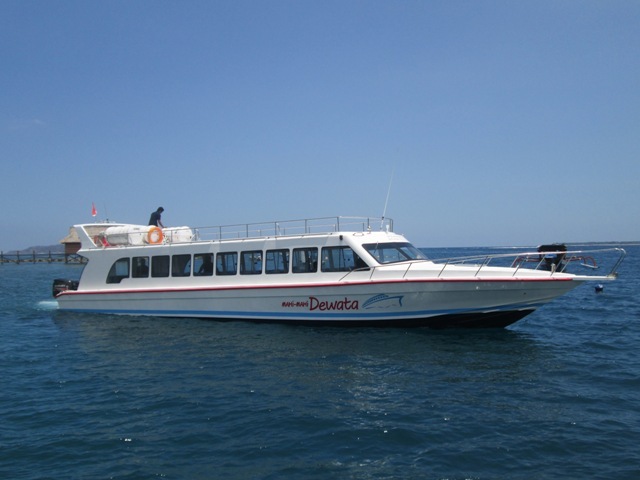 The ferries used on the run between Lombok and Bali do not conform to many Internationally recognized safety and operational standards. It is prudent to keep alert and be aware of your position and situation whilst on board and make yourself aware of the positioning of life preserving equipment. If inside the main cabin or below decks try to ensure you orient yourself to the layout of the ships decks and emergency exits especially if traveling at night. You should maintain a clear head and use caution at all times when embarking and disembarking as the decks and ramps can be slippery and the passengers can at times behave in a chaotic manner especially when disembarking. Be aware that heavy vehicles as well as cars and motorbikes are moving onto and off the ships at the dock and will using the same loading ramp as the passengers. Be careful to keep track of your bags and watch out for pick pockets if in a crowd waiting to board or disembark. Public Ferry from Lombok to Sumbawa, daily departure from Labuan Kayangan (East Lombok) to Pototano (West Sumbawa). Travel time is approx 1,5 hour. 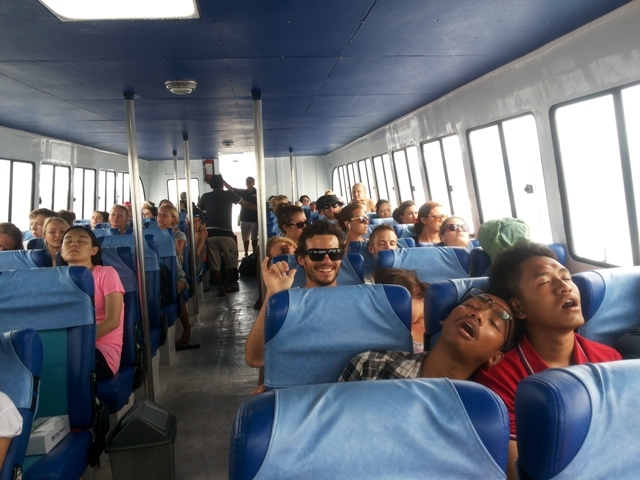 The Fast Boats offers the quickest and easiest way to get from/to Padangbai (Bali) and from/to South of Bali at Serangan Harbor (Bali) to the Gili Islands and Lombok. it is a 100% domestic investment enterprise specializing in high speed boat transport and boat private charter. 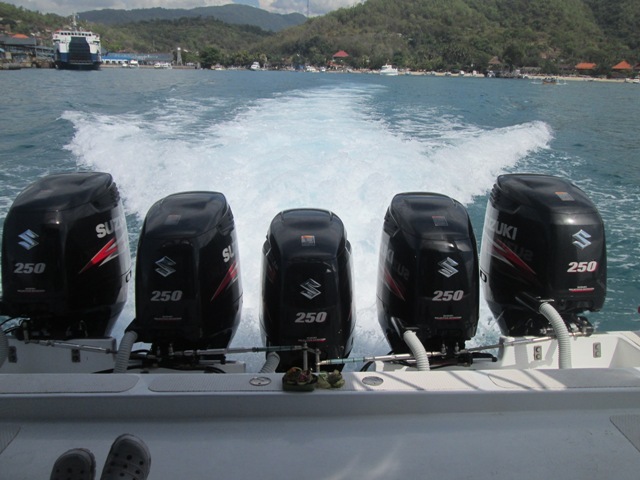 We are the new comer the fast boat service from Bali to the Gili islands and Lombok, but a 100% safety record. We put the emphasis on safety, professionalism and guest satisfaction in all fast boat, established in October 2013. Ownership: Balinese, established in Bali, Indonesia. We currently have more than 30 staff. All crew are fully licensed with requisite certificates of competence, and have many years experience in the waters around Bali and Lombok. All trips include hotel transfers in Bali area, insurance, buffet morning coffee/tea prior departure and mineral water served on board. Our Check in point from our private facility in Padangbai Harbor ensures a comfortable waiting area upon arrival and departure, with toilets, showers and full restaurant facilities. 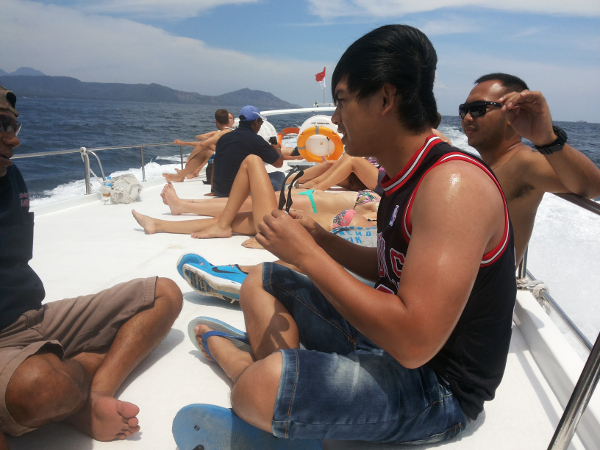 Sphere of our operation is high speed boat transport from Bali to Gili Islands and Lombok. 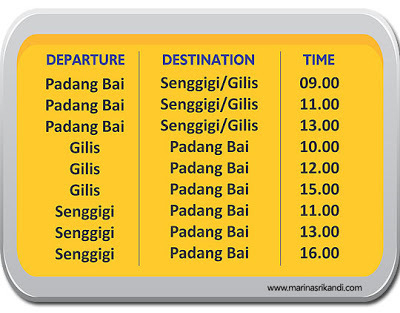 Marina Srikandi 8 will begin operating around the 3rd week of December 2012. The route will be opened directly from Padang Bai harbor Bali to Senggigi Lombok 4 times a day. Marina Srikandi Super Fast Ship 8 is the latest, largest and fastest of the first times in history operated for Bali-Lombok. "The decision of the route of Padang Bai - Senggigi is part of our focus on open access Bali – Lombok to bring more tourists back to the area of Senggigi and simultaneously raise the profile of Marina Srikandi, this is a dream that has long buried deep in the heart. Marina Srikandi Fast Boat 1, 2-8 operate from Padangbai (Bali) to the Gili islands (Gili Trawangan and Gili Air), Marina Srikandi. 8 of Padangbai to Lombok Senggigi. All above content copyright ©trekkingrinjani site owned and governed by Mr. Satya Budi since 1999. In accessing the site ©Trekking Rinjani you must agree that you are only able to download the contents for personal gain which is not commercial. Copyright ©Trekking Rinjani 2019. All rights reserved.